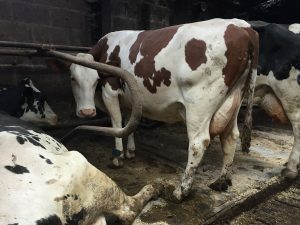 The Midlands Group recently held a meeting at which Ferreol Roche judged cows which members brought along video clips of, for the first competition of its kind there were a number of entries, without the need for preparation, transport or movement off farm. 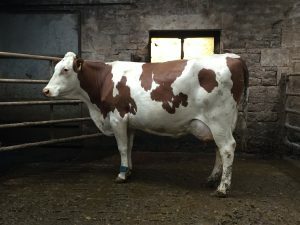 The victorious cow was Imperiale from John Harvey and family of the Sparrowlee herd, she calved her third on 12th October 2017, and is giving 33.7kg per day, with her last test at 4.40% fat and 3.42% protein with cells of 94. She is a VG87 Brink daughter, and had a Jilbeer daughter this time. 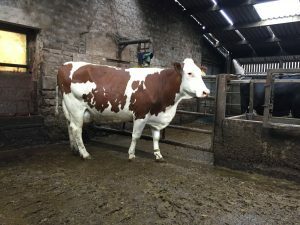 Her 2nd lactation was 8170kg and she has done 4303kg in 117 days so far. Well done.